Examinations are designed to assess the performance of students in their various courses of study. Either internal or external, examinations are not meant to victimize students or create unnecessary fears in them. Due to the wrong perception of some students about examinations, they device diverse means of achieving good success. Examination malpractices have soared very high and become commonplace in the society today. This is not only peculiar to the secondary schools but even in tertiary institutions. Students either try to buy assignments, copy from friends, some use previous publications without citing appropriate references, some ladies give their bodies to lecturers and male students so they could be assisted during their examinations or be helped on their assignments, some carry written documents (expo, as usually called) into the hall, change their answers after marking and request for a remarking, while others collude with friends in order to pass their examinations. It is sinful to be involved in any of these academic vices. As we approach our examinations, what are the important things to be noted? #1. Learn to handle anxiety by having sufficient sleep and stick to your revision plans. #2. Copy your examination time table and check from time to time to make sure there is no change in date, time or venue. #3. A day before exams, make sure all your writing materials are put together viz: pen, calculator, drawing sets, etc. Researches have shown that anxiety ranks high among the main problems of students during examination periods. first, arrive on time. There is no worse start than to arrive at the last moment, harassed and mentally off-balance. Secondly, read all instructions carefully. Take note of compulsory questions and the use of language on each question. E.g. enumerate, discuss, explain with the aid of diagram, etc. Thirdly, read the whole paper twice making notes against the question you can answer and note certain examination terms such as discuss, examine, justify, outline, explain, etc. Thereafter, do the question you know best first, this will give you confidence. Subsequently, it may be helpful to divide up the time equally between the remaining questions and then attempt the remaining questions in their increasing order of difficulty. It is very important to read your paper through at the end of the examination. Make sure you attach all extra sheets used together before submitting your paper. It is advisable not to hold post-mortem discussions/arguments about the written paper with other candidates after the examinations. 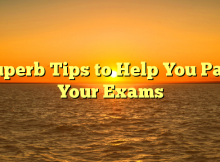 You gain nothing by so doing because if you discover that you have made a bad error, this could bother you and affect your preparation for the remaining exams. If you think you have failed, pray rather than being worry, many have thought they had failed but later passed.